The article reviews the background of Armenia’s decision to join the Eurasian Economic Union (EEU) instead of signing an Association Agreement with the European Union. The analysis of the controversies behind that decision and subsequent complications is followed by a review of the economic effects of Armenia’s EEU membership, including the influence of the Russian economic crisis on Armenia. 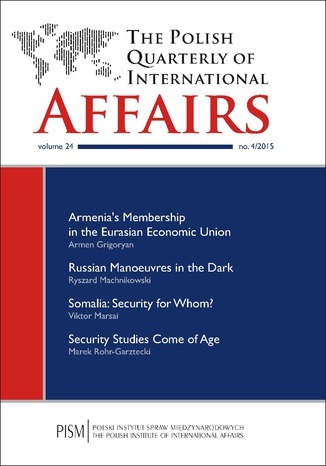 Finally, the article examines the international context and the regional security risks in relation to the different aspects of Armenia’s growing dependence on Russia. Russia’s “assertiveness” in defending its interests, be it in Ukraine or Syria, should not come as a surprise because this mood is perceived by the Kremlin as a necessary tool in a world in which many states turn to military might to forward their vital interests. Through his actions, President Putin wants to convince both external actors as well as his own population that the reckless ignorance of Russia’s vast interests will only lead to more chaos. The sudden emergence of the Islamic State in the summer of 2014 gave Russia the perfect pretext for a military intervention that could be presented to both the international and home public under the banner of “joining the anti-IS alliance.” In so doing, Russia wanted to create the impression that there was no rift between itself and the West. Russia’s “gambit” in Syria brought immediate propaganda results for President Putin—domestic public support for him skyrocketed once again as it did after the triumphant seizure of Crimea. Somalia has gone through significant changes since 2012. On the one hand, the country has remained a failed state that cannot prevent the spread of radicalism in the region, the federal government’s institutions are fragile, and the roadmap in Vision 2016 is questionable and has been delayed. On the other hand, most Somalis enjoy relative peace and stability, the economy and infrastructure are improving, and daily life has normalised significantly in comparison with the period of 2010–2011. The most important task for the Somalis and international actors is to maintain the slow but forward process of recovery and minimise all contrary factors. Regional Security Complex Theory (RSCT) has been developed within the Copenhagen School and has undergone significant evolutions in recent years. This article is part of this trend through the application of RSCT to assumptions about the region of Central Asia and its threats. The article’s main objective is to examine the current characteristics and dynamics of Central Asia as a regional security complex. It draws attention to the important issues of international politics driven by internal and external players. Moreover, the content shows that “the security complex” is both an analytical tool and ontological category, and can be applied in practice. Lauded as the backbone of both the EU and the U.S. economies, Small and Medium-Sized Enterprises (SMEs) have dominated the heated debate over the Transatlantic Trade and Investment Partnership (TTIP) raging across Europe in 2015. TTIP negotiators are convinced that small businesses will be the main beneficiaries of the deal. However, due to varying levels of internalisation and innovation across sectors and countries, the benefits are unlikely to be evenly distributed. SMEs with cutting-edge technologies are the most likely to reap profits from TTIP, and thus spurring innovation should be among the priorities of especially the Central and Eastern European countries, which often lag in terms of pioneering products. Can Terrorists Be Denied Refugee Status? In the aftermath of the terrorist attacks in Madrid, London and Paris, public security has been widely quoted to assert that access to an asylum claim for refugees should be limited. Media reporting on those incidents regularly refer to the immigration status of the perpetrators of the acts. In other reports, they have connoted the existence of a link between irregular immigration and criminality. Given this context, it is worth recollecting Para. 73 of the judgment by the European Court of Human Rights (ECHR) of 15 November 1996 in the case Chahal v. The United Kingdom (Application no. 22414/93), in which the court concluded that, “Contracting States have the right, as a matter of well-established international law and subject to their treaty obligations ... to control the entry, residence and expulsion of aliens.” Nevertheless, the legitimacy of a state to manage immigration must respect human rights, including the non-refoulement principle. Hungary is usually not considered a country associated with terrorism. Having worked more than a decade in Hungarian public service, the author has often encountered statements that terrorism is even non-existent in Hungary. However, this may not be true any longer (if it ever was) due to the rise of the terrorist threat throughout Europe. In this paper, the author tries to take stock of the counter-terrorism provisions in Hungary’s criminal law, focusing on the question of whether the law is actually aligned with the relevant EU standards and whether it is able to handle the current threat. The conclusion is that both the law in force (although mostly in line with the relevant international standards) and the related practice of the authorities could be improved, taking into account the new nature of the terrorist threat Europe is facing. At the beginning of the 21st century, Indonesia was still in a period of transformation from an authoritarian to a democratic state. The weaknesses of its political and economic structures hinder the country’s development. During the tenure of President Susilo Bambang Yudhoyono’s (popularly called “SBY”), which began in 2004, Indonesia’s young democracy has become stronger and its economic potential has begun to be tapped. This has prompted growth in the country’s capacity and willingness to play an active role in international politics, mostly regionally, but also with considerable moves having been made on the global stage (for example, joining the G20 forum). Indonesia’s approach to changing international conditions is driven by the bebas-aktif (“free and active”) principle, which has been at the core of Indonesian foreign policy for more than six decades. This paper examines the historical background of the bebas-aktif principle and how Indonesian foreign policy has been conducted in the 21st century, especially during SBY’s tenure, given the main elements of the bebas-aktif doctrine.